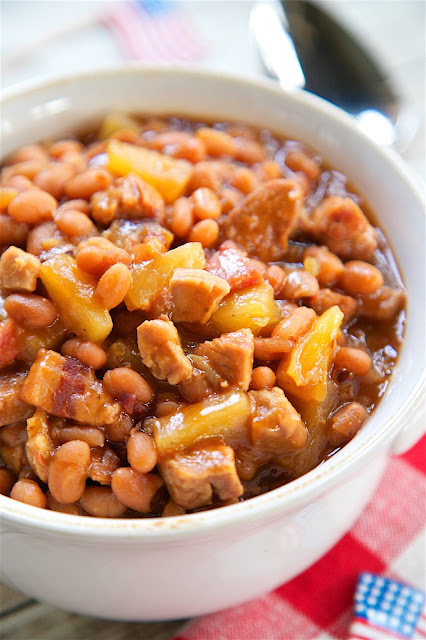 Slow Cooker Pineapple Baked Beans - absolutely THE BEST baked beans! Bacon, baked beans, onion, mustard, bbq sauce, smoked pork and the secret ingredient - pineapple! SO good! I could make a meal out of these delicious beans! They slow cook all day in the slow cooker. Great for a potluck crowd. Took these to a cookout and everyone asked for the recipe! 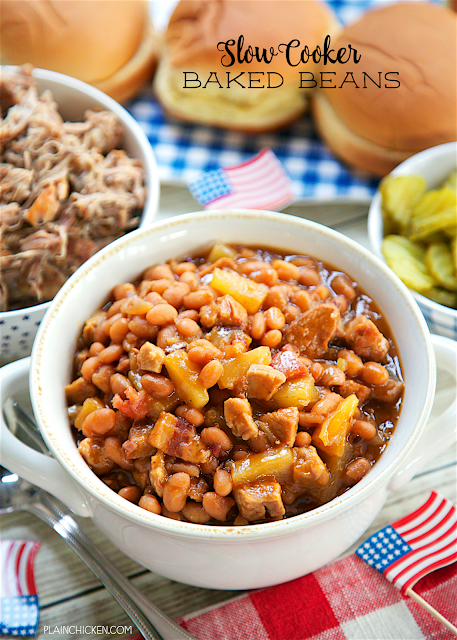 These Slow Cooker Baked Beans are my new favorite baked bean recipe. I could make a meal out of these beans. They are CRAZY good!! These are not your ordinary baked beans. There is a secret ingredient that makes all the difference. What is the secret ingredient? Pineapple tidbits! Sounds weird, but it totally makes this recipe! SO good! These Slow Cooker Baked Beans start off with some canned baked beans. Next, add some bacon, onion, brown sugar, bbq sauce, mustard, pineapple and pulled pork. Seriously, it could be a main dish! I used some leftover Slow Cooker Bourbon and Coke Pulled Pork in these beans. You can buy some pork from your favorite BBQ joint or in the refrigerated section at the grocery store. This recipe makes a TON. It would be great for a potluck or cookout. The beans reheat well. We ate these a few days in a row and they tasted great every single time! Slow Cooker Baked Beans - absolutely THE BEST baked beans! Bacon, baked beans, onion, mustard, bbq sauce, smoked pork and the secret ingredient - pineapple! SO good! I could make a meal out of these delicious beans! They slow cook all day in the slow cooker. Great for a potluck crowd. Took these to a cookout and everyone asked for the recipe! Combine all ingredients in a 6-qt slow cooker. Cover and cook on LOW for 5 hours. Uncover and cook an additional hour, or until sauce thickens. I bet these would make a great Sloppy Joe-style sandwich! I love that they could be made vegetarian rather easily for the herbivores in our family and can feed a crowd for summer BBQ's! You never use fresh onions, do you? I only ever use flakes for really fast recipes, or deviled eggs. They don't have the same flavor.